The Ministry of Agriculture, Land and Fisheries carried out a locust training session and destroyed three egg-beds earlier this week. 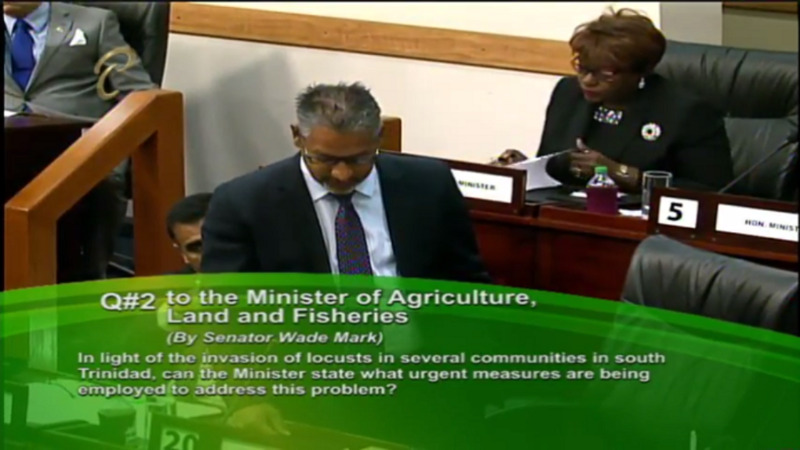 In a statement, the Ministry said the pest abatement exercise was launched by its County Victoria staff on Friday, November 10 and detected three separate Moruga locust (Coscineuta virens) egg-beds in the Tableland area. These discoveries were as a result of the efforts of a joint team of staff from the Ministry's St Patrick East; Victoria; Nariva / Mayaro and Caroni Counties, who visited each of the three sites as part of their practical locust training session on Tuesday November 14. The training – which was facilitated by Agricultural Assistant III (with direct responsibility for the Locust Control Programme in County Victoria), Rudy Ramdass – targeted approximately 40 staff involved in the operational elements of locust management inclusive of monitoring, tracking and chemical control. Ramdass said the egg-bed finds were a positive sign in the Ministry's efforts toward the effective control of locust populations in the area. 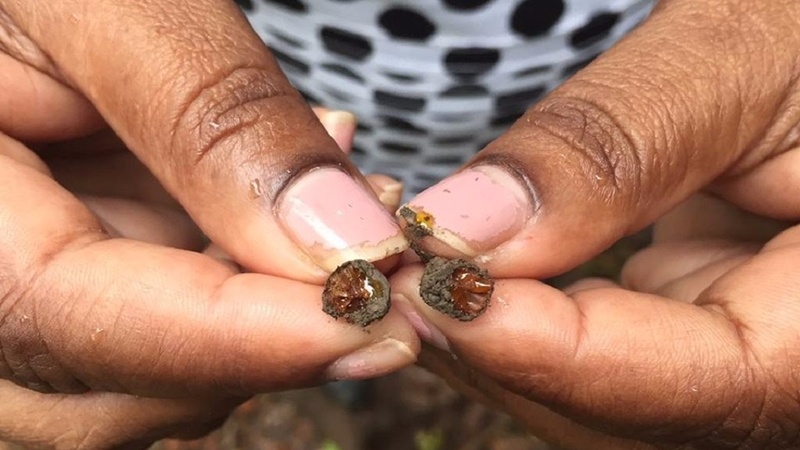 "Traditionally, egg beds are much harder to find as they tend to be isolated in highly forested areas and are only revealed after they emerge in the hopper stage." He said finding the creatures in the egg-bed stage is critical in order to make a significant dent in the locust population. 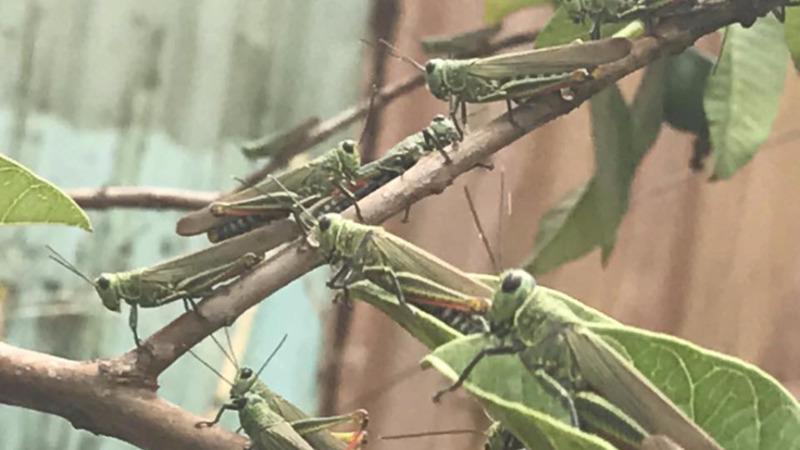 "During the egg-bed stage, we can potentially kill thousands of locusts per square metre as opposed to hundreds in the emerging and hopping stage and as few as 10 locusts per square metre during the adult stage," he said. He also noted that because the area was not traditionally a locust-populated site, any proactive measure aimed at limiting the geographical spread of the pest was to be explored and welcomed. 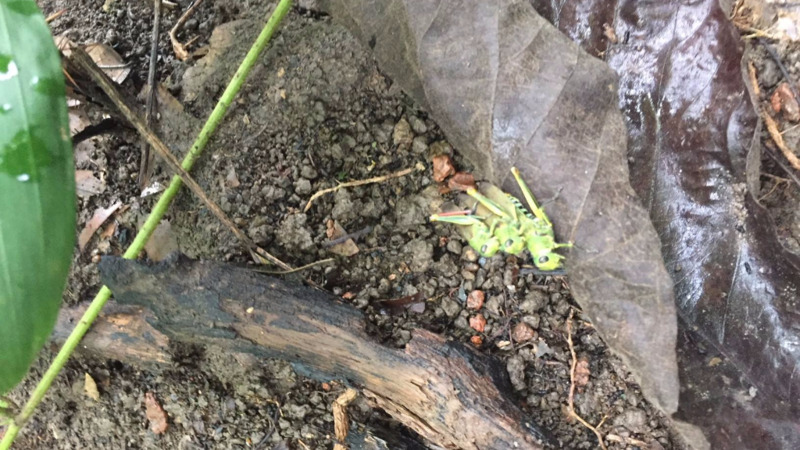 "The locusts are no longer confined to the 10-mile radius between Moruga and Guayaguayare but have traversed and settled as far as 40 feet from their nesting sites, to areas such as but not limited to Tabaquite; Braso; Piparo; Caparo Valley and Tableland," he observed. Also attending the training exercise were the Ministry's Acting Director of the Regional Administration South (RAS) Division, Dr Michelle Mellowes, and County Agricultural Officer (Victoria) Sati Gangapersad. To report sightings of the Moruga locust and for additional information on the agricultural pest, please call the Victoria County Agricultural Office in Princes Town at 655-3428/7526/5637.